With the creativity-charged atmosphere at the 2018 Beautycon Festival, celebrity guest Zendaya made sure to dress accordingly. The “Spider-Man: Homecoming” star looked like an art piece herself in an Akris Spring 2018 long-sleeved dress that featured a colorful, wooden-doll print design. Note the interesting car wash fringe detailing on the arms. Zendaya chose to highlight the orange hues on her dress by pairing the piece with orange suede Christian Louboutin “So Kate” pumps. She rounded out her styling with Jennifer Fisher “Erin” gold hoop earrings, silver eyeshadow and a slicked-back braided hairdo. Zendaya in an Akris Spring 2018 wooden-doll-print long-sleeved dress and Christian Louboutin “So Kate” orange suede pumps at day two of Beautycon 2018 held at the Javits Center in New York City on April 22, 2018. 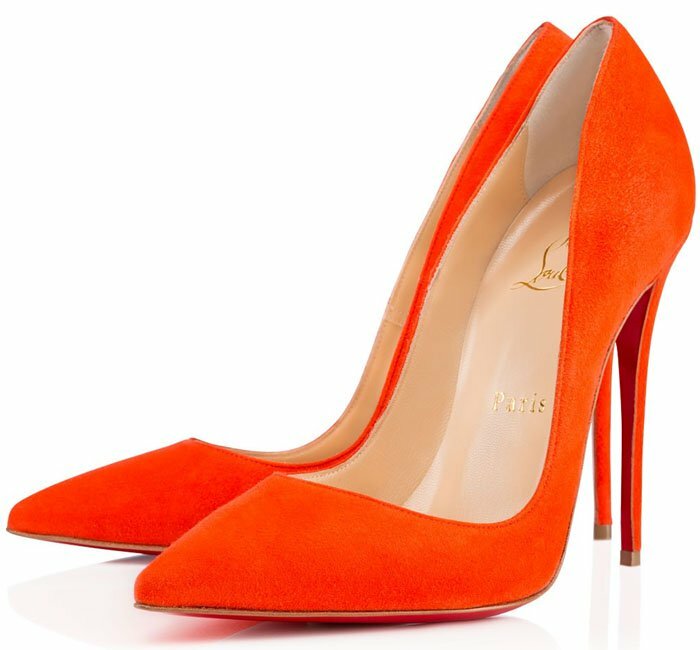 Closeup of Zendaya’s orange suede Christian Louboutin “So Kate” pumps. Z wasn’t the only colorful one at Beautycon 2018. “Orange Is the New Black” actresses Danielle Brooks and Dascha Polanco also served up some pretty vibrant looks at the beauty and fashion gathering. 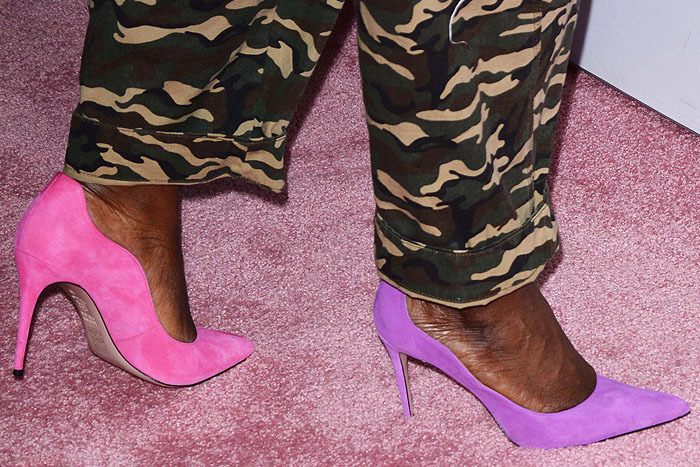 28-year-old Danielle rocked the mismatched shoes trend and wore one pink and one purple suede pump to complete her patched denim vest, gray crop top and camo pants ensemble. Her curvy ‘Anika’ pumps are from the James Chan Collection and can be purchased for $245 at Nordstrom. 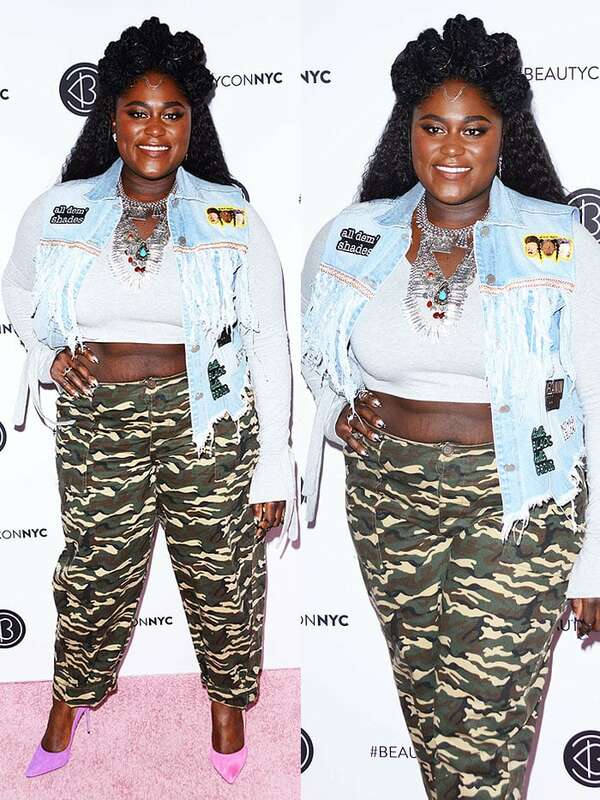 Danielle Brooks in a patched denim vest, a gray crop top, camo pants and mismatched pink and purple pumps at Beautycon 2018. A deliciously curvy topline brings a flirty counterpoint to the pointy toe and tall, slender stiletto of a high-backed pump. Dominican-American actress Dascha, on the other hand, went for a red-hot bombshell look in a sheer, dotted dress and fur-sleeved bomber jacket combo. She chose the white python version of the Christian Louboutin “So Kate” pumps, which matched perfectly with the white bra and red, high-waisted shorts she had on underneath. Dascha Polanco in a sheer, dotted dress, a fur-sleeved lace-up bomber jacket, a white bra, red high-waist shorts and white pumps at Beautycon 2018. Closeup of the Christian Louboutin “So Kate” pumps in white python on Dascha Polanco.